WHAT: Disney Store will celebrate the opening of the newly designed store at Mall of America in Bloomington, Minnesota, on Wednesday, October 12, 2011. 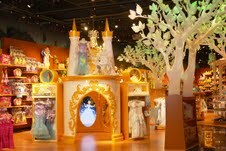 The Disney Store at Mall of America is one of many newly-designed Disney Store locations to open worldwide in 2011. The first 250 guests who attend the public celebration will receive FREE Mickey Mouse ears. Located on the Level One, South at the Mall of America, the new Disney Store offers a one-of-a-kind, interactive and magical experience for Disney fans of all ages. Disney Store’s new design concept aims to deliver “the best 30 minutes of a child’s day” through immersive experiences including a Disney Princess with Magic Mirror, Translucent Trees, and the Disney Store Theatre featuring the latest Disney entertainment. With each new store opening in 2011, Disney Store will donate 10 percent of the first day’s sales to the Make-A-Wish Foundation in the United States. The Disney Store retail chain, which debuted in 1987, is owned and operated by Disney in North America, Europe, and Japan. Disney Store is the retail merchandising arm of Disney Consumer Products, the business segment of The Walt Disney Company (NYSE:DIS) and its affiliates that extends the Disney brand to merchandise. Disney Store carries high-quality products, including exclusive product lines that support and promote Disney's key entertainment initiatives and characters. Disney Store opened its first store in Glendale, California and, in doing so, originated the themed retail business model. There are currently more than 200 Disney Store locations in North America; more than 40 Disney Store locations in Japan; and more than 100 Disney Store locations in the United Kingdom, France, Spain, Ireland, Italy and Portugal, plus online stores www.DisneyStore.com and www.disneystore.co.uk. Each Disney Store location offers a magical shopping experience that can only be delivered by Disney, one of the world's largest and most successful entertainment companies. For more information, please visitwww.disneyconsumerproducts.com/press/us/disneystore or follow us at www.facebook.com/DisneyStore and www.twitter.com/DisneyStore. Oh how fun! I remember the excitement of visiting a grand opening of a Disney store and the first one I'd ever seen!